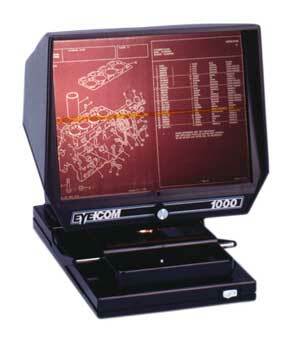 The EC1000 Microfiche reader is Eye Com’s most compact reader. Standing only 14″ high, it saves valuable desk and counter space. This low maintenance fiche reader is designed to view COM and Source Document microfiche at 75% of original size. Primarily, a 75% COM reader, the EC 1000 covers all standard formats while providing a sharp, bright, easy to read image. A unique floating lens system assures constant focus over the entire film area. Lenses can be changed on the EC1000 microfiche reader and a drive belt focusing system provides razor sharp images with no backlash. Supplies and accessories are listed at the bottom of the page. 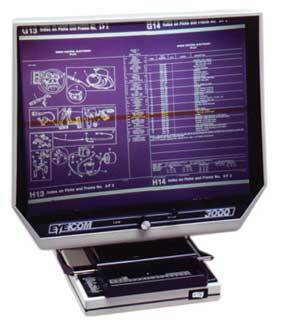 The Eye Com EC3000 microfiche reader has a larger viewing screen at 11″ x 14″ which allows you to view 100% Source. Although it has this larger screen for easy on the eyes viewing, this microfiche reader is still very lightweight and compact. All Eye Com desktop readers on this page come with a replacement 13.8V, 28W FLT lamp, deluxe cleaning kit and dust cover. Supplies and accessories are listed at the bottom of the page. Replacement 13.8V, 28W FLT Lamp, Deluxe Cleaning Kit and Dust Cover included.